we will get the answer no. But (as we shall soon see) we can also use append/3 to split up a list. In fact, append/3 is a real workhorse. There’s lots we can do with it, and studying it is a good way to gain a better understanding of list processing in Prolog. This is a recursive definition. The base case simply says that appending the empty list to any list whatsoever yields that same list, which is obviously true. But what is the procedural meaning of this definition? What actually goes on when we use append/3 to glue two lists together? Let’s take a detailed look at what happens when we pose the query ?- append([a,b,c],[1,2,3],X) . The basic pattern should be clear: in the first four lines we see that Prolog recurses its way down the list in its first argument until it can apply the base case of the recursive definition. Then, as the next four lines show, it then stepwise ‘fills in’ the result. How is this ‘filling in’ process carried out? By successively instantiating the variables _G593 , _G590 , _G587 , and _G518 . But while it’s important to grasp this basic pattern, it doesn’t tell us all we need to know about the way append/3 works, so let’s dig deeper. Here is the search tree for the query append([a,b,c],[1,2,3],X) . We’ll work carefully through all the steps, making a careful note of what our goals are, and what the variables are instantiated to. Goal 1: append([a,b,c],[1,2,3],_G518) . Prolog matches this to the head of the recursive rule (that is, append([H|T],L2,[H|L3]) ). Thus _G518 is unified to [a|L3] , and Prolog has the new goal append([b,c],[1,2,3],L3) . It generates a new variable _G587 for L3 , thus we have that _G518 = [a|_G587] . Goal 2: append([b,c],[1,2,3],_G587) . Prolog matches this to the head of the recursive rule, thus _G587 is unified to [b|L3] , and Prolog has the new goal append([c],[1,2,3],L3) . It generates the internal variable _G590 for L3 , thus we have that _G587 = [b|_G590] . Goal 3: append([c],[1,2,3],_G590 ). Prolog matches this to the head of the recursive rule, thus _G590 is unified to [c|L3] , and Prolog has the new goal append(,[1,2,3],L3) . It generates the internal variable _G593 for L3 , thus we have that _G590 = [c|_G593] . Goal 4: append(,[1,2,3],_G593 ). At last: Prolog can use the base clause (that is, append(,L,L) ). And in the four successive matching steps, Prolog will obtain answers to Goal 4, Goal 3, Goal 2, and Goal 1. Here’s how. Answer to Goal 4: append(,[1,2,3],[1,2,3]) . This is because when we match Goal 4 (that is, append(,[1,2,3],_G593) to the base clause, _G593 is unified to [1,2,3] . Answer to Goal 3: append([c],[1,2,3],[c,1,2,3]) . Why? Because Goal 3 is append([c],[1,2,3],_G590]) , and _G590 is the list [c|_G593] , and we have just unified _G593 to [1,2,3] . So _G590 is unified to [c,1,2,3] . Answer to Goal 2: append([b,c],[1,2,3],[b,c,1,2,3]) . Why? Because Goal 2 is append([b,c],[1,2,3],_G587]) , and _G587 is the list [b|_G590] , and we have just unified _G590 to [c,1,2,3] . So _G587 is unified to [b,c,1,2,3] . Answer to Goal 1: append([a,b,c],[1,2,3],[b,c,1,2,3]) . Why? 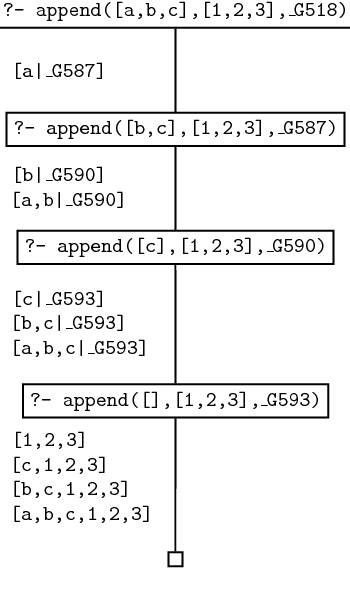 Because Goal 2 is append([a,b,c],[1,2,3],_G518]) , and _G518 is the list [a|_G587] , and we have just unified _G587 to [b,c,1,2,3] . So _G518 is unified to [a,b,c,1,2,3] . Thus Prolog now knows how to instantiate X , the original query variable. It tells us that X = [a,b,c,1,2,3] , which is what we want. This type of pattern lies at the heart of the way append/3 works. Moreover, it illustrates a more general theme: the use of unification to build structure. In a nutshell, the recursive calls to append/3 build up this nested pattern of variables which code up the required answer. When Prolog finally instantiates the innermost variable _G593 to [1, 2, 3] , the answer crystallises out, like a snowflake forming around a grain of dust. But it is unification, not magic, that produces the result. Now that we understand how append/3 works, let’s see how we can put it to work. That is, we give the list we want to split up (here [a,b,c,d] ) to append/3 as the third argument, and we use variables for the first two arguments. Prolog then searches for ways of instantiating the variables to two lists that concatenate to give the third argument, thus splitting up the list in two. Moreover, as this example shows, by backtracking, Prolog can find all possible ways of splitting up a list into two consecutive lists. Make sure you understand why the results come out in this order. That is, SubL is a sublist of L if there is some suffix S of L of which SubL is a prefix. This program doesn’t explicitly use append/3 , but of course, under the surface, that’s what’s doing the work for us, as both prefix/2 and suffix/2 are defined using append/3 .